Have you considered volunteering? A free programme to equip people to become volunteers is running on Thursday afternoons (12.30-3pm) after Easter at Beechview Academy in High Wycombe. Community partners Wycombe Wanderers Sports & Education Trust and Empower to Cook CIC are looking for more volunteers to support local community projects including Fit and Fed. The Fit & Fed project looks to help families that “feel the pinch” providing children and their families with cooking tutorials, fun physical activities and a free meal for the whole family helping children stay fit and healthy. We are looking to train volunteers up in both how to teach others how to cook and the basics of how to set up an activity session and generally be an encouraging force to all the families that walk through the door! Taster session for volunteers – 1-2pm 21st March. The past few months have seen us launch our corporate wellbeing workshop program with leading pharmaceutical company, Janssen UK (a subsidiary of Johnson & Johnson). The workshops involve a half day cooking activity, nutrition talk and shared meal for teams of up to 12 people. We provided a fun session from which novices and competent cooks alike took away new ideas and inspiration to engage with real food. “Fantastic, educational and fun; a great way to bring the team together”. This is just one of the ways in which we have been lucky enough to have the support of the leading pharmaceutical company, Janssen UK (a subsidiary of Johnson & Johnson). Their policy of looking for opportunities to support social enterprise through their normal commissioning requirements is transformational. Using a local social enterprise to provide a team event which supports the well-being of staff is an excellent way of helping the community. If a well-being event might be of interest to your company please do get in contact and help us make a difference to your teams and local people. *statistics based on parent surveys. Thanks to the children, parents and teachers of King’s Wood Primary, Foxes Piece School and Lane End School for helping us inspire the children to make healthy everyday choices. Buckinghamshire County Council for funding an extension to the programme – we have recently been awarded funds via the Chesham and Chiltern Local Area Forum to run the healthy eating workshops and a follow up programme of parent and child cooking at Waterside Primary Academy in Chesham in autumn 2018-spring 2019. Last month, Empower to Cook CIC began a new healthy eating programme to be run across 4 schools in the High Wycombe area. The Classroom Kitchen project comprises, five sessions of food education and an opportunity for the children to learn about and try different foods. The programme offers a unique perspective on healthy eating, inspiring the children to make good everyday food choices and keep treats as ‘sometimes’ foods. Week 1 is an introduction to the principles of eating well, week 2 looks at healthy breakfasts, week 3, snacks and drinks. In week 4, we introduce a practical element and the children chop, cook and taste lots of different vegetables. The final week sees the parents joining the session and cooking with their child. In this way, we hope the programme will have the maximum impact on the children’s everyday eating habits from a younger age. The feedback from the sessions so far has been positive, with 2 out of 3 children liking something they hadn’t tried before or hadn’t liked before. We would like to thank Heart of Bucks for funding this project. Our thanks also goes to the four schools piloting this new initiative; King’s Wood Primary, Hannah Ball Primary in High Wycombe, Lane End Primary and Foxes Piece Primary in Marlow. We hope to be able to roll out this programme across many more schools in Bucks. The start of this year has seen Empower to Cook reflecting on how we can best achieve our mission of inspiring, motivating and empowering people through cooking. 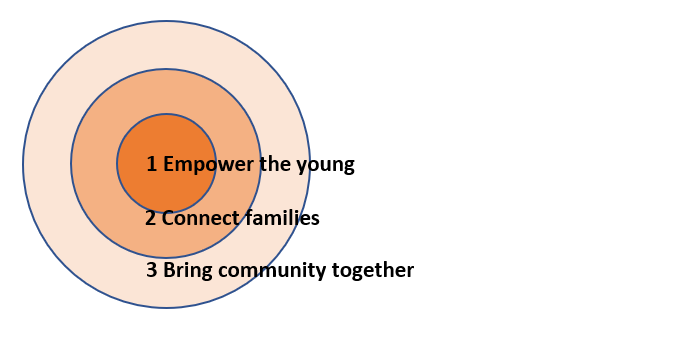 We have adjusted our aim to ensure E2C workshops help those in vulnerable communities to build life skills as well as improve their physical and mental wellbeing. This exercise has also allowed us to develop a greater understanding of the difference we can make and formulate some clear goals for the future. Improving health through better food choices. Helping people eat well, affordably. Providing valuable life and employability skills. A hands-on activity for better mental health and improved confidence. A practical way to learn a variety of educational skills. Improving the employment opportunities and aspirations of all. Support the most vulnerable people, particularly in the pockets of deprivation in Wycombe. Utilise food that would otherwise be wasted. Why focus on High Wycombe? 2017 is shaping up to be an exciting time for Empower to Cook. In early December we moved into our new premises, and since then, we have been hard at work clearing the space and transforming it from a photographic studio into a community cookery and wellbeing kitchen. We’ve made lots of progress and hope to be finished very soon. To introduce the new space to our friends and supporters, we held a pre-launch open evening on 27th February. The event was jointly hosted with Khepera CIC, nutrition educators, who we are collaborating with and are sharing the community kitchen with us. It was a fantastic night attended by over 40 people, many of whom were heads of department from local government, public health, local schools and businesses, and included the Mayor of High Wycombe, Zia Ahmed and Councillors Lesley Clarke OBE and Matt Knight. Meanwhile, our day-to-day work continues with two exciting new projects. We have just been awarded funding by the Big Lottery Fund to carry out a ‘Kids as Teachers’ project at Chiltern Wood School. Groups of children with learning difficulties will take part in a course that teaches them to teach their parents to cook. We are also working with Marsh and Micklefield Big Local to run a Community Cook project. Over the coming weeks, we will be holding sessions for parents and children at Beechview School. The families are taught new techniques for cooking nutritious meals that are affordable and can be easily replicated at home, including using up leftovers and store cupboard ingredients. We are still looking for people to support us in a variety of ways. At the open evening we had a pledge tree with leaves to represent the business requirements and skills that we need to move forward as a social enterprise. It includes opportunities for volunteering as well as financial assistance. If you can help in any way, we would love to hear from you. Empower to Cook will be holding an open evening on Monday 27th February for anyone who would like to meet the team, see our new community cooking and wellbeing kitchen and learn about our exciting plans for the future. Drinks and nibbles will be supplied by Khepera CIC, nutrition educators who are sharing the premises with us. We will be there from 4.00-6.30pm, so if you would like to join us, please email info@empowertocook.co.uk. Thanks to matched funding from Bucks County Council Public Health, we will be holding teacher seminar days for schools in the Wycombe, Chalfont and Chesham areas. For primary school teachers and learning support assistants who deliver food lessons, this is an opportunity to build practical cooking skills along with lesson ideas and nutrition knowledge linked to the National Curriculum. We are offering a choice of dates in March as full day or 3-hour twilight seminars. The practical sessions will be led by Michael Brown, founder of Empower to Cook, with planning and resourcing sessions run by Heidi James and Sheila Bees. For full details of dates and prices, email info@empowertocook.co.uk or call 07799 734258. Welcome to our first ever Empower to Cook newsletter. We wanted to share with you a bit about what we are doing as a social enterprise this autumn and a few of our most exciting projects. ‘Grubs Up’ is a practical cookery and nutrition education programme for young people. The aim of this project is to give young people the knowledge and skills to help themselves. Groups of 14-18 year olds will attend sessions to improve cooking skills and food preparation methods, teach them basic nutritional information and ways to make delicious and nutritious meals on a budget. The project is being delivered in partnership with Public Health and Children’s Social Care Services. Home Savvy is an exciting new project being run by Empower to Cook and Khepera CIC. We are working with twelve families in social housing to give them the skills and know-how to cook healthier, tasty meals within a budget, together with education on nutrition and home budgeting. Our thanks go to Home Group and Marsh & Micklefield for supporting this project. We have worked with Chiltern Wood school for the past three years, running Empower to Cook clubs within the school day. This year we are continuing the great work with unique projects, food events and a pop-up cafe. We’ve had some fantastic feedback about our sessions and work will begin soon to develop more food education on the curriculum at Chiltern Wood. We are really excited to be involved in some interesting local events this summer. On 23rd June, we ran a community engagement event in partnership with Thames Valley Housing, cooking a vegetarian barbecue for residents. As part of our commitment to food surplus and sustainability, the food was supplied by Fare Share, who re-distribute surplus food in order to tackle food waste. 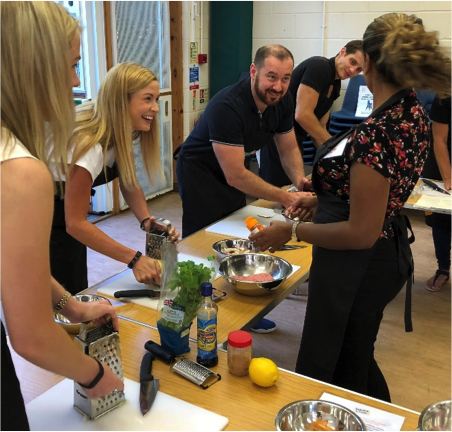 During the summer we have partnered with Home Group social housing in High Wycombe and Rayners lane, Harrow running children's cookery workshops. Both themed. One around a community café event in the autumn and the other linked to the Olympics.